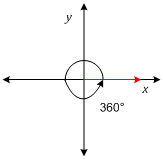 A rectangular coordinate system consists of x-axis and y-axis that divide a plane into four regions called quadrants. 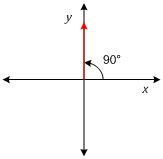 The point where the two axis intersect is called origin and is denoted by O.
Angles between `0^\circ` and 9`0^\circ` are in the first quadrant. Angles between `90^\circ` and `180^\circ` are in the second quadrant. Angles between `180^\circ` and `270^\circ` are in the third quadrant. Angles between `270^\circ` and `360^\circ` are in the fourth quadrant. 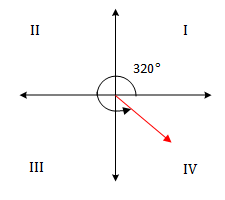 An angle in standard position is said to lie in a quadrant if its terminal side lies in that quadrant. 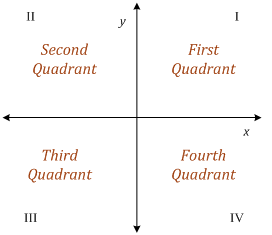 In the figures below, `\apha` lies in the 1st quadrant, `\beta` lies in the 2nd quadrant, `\gamma` lies in the 3rd quadrant and `\theta` lies in the 4th quadrant. 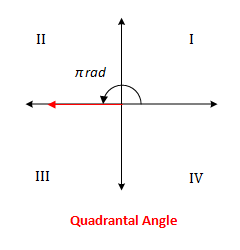 An angle in standard position is called a quadrantal angle if its terminal side lies on x-axis or y-axis. Quadrantal angles include `0^\circ`, `\pm90^\circ`, `\pm180^\circ`, `\pm270^\circ`, `\pm360^\circ` etc. 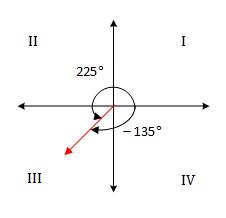 Some of these angles have been illustrated in the figures below. Note that the terminal side of these angles lies either on x-axis or on y-axis. Since `320^\circ` lies between `270^\circ` and `360^\circ`, the angle lies in the 4th quadrant. 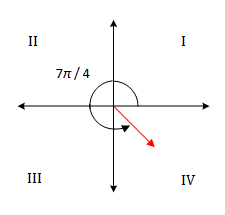 Since `(7\pi)/4` radian = `315^\circ` , it lies in the 4th quadrant. 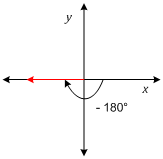 Since `\pi` = `180^\circ` lies on x-axis, it is a quadrantal angle as shown below. Are you a member? Sign in!